William Battle McQueen and David L. Siddall had 50 years combined of legal experience when the two men, one from Florida and the other from Texas, decided to embark on a new path in their legal careers. McQueen, who had become a licensed Florida attorney-at-law 25 years ago, and Siddall, who had served as Deputy General Counsel for two very large oil and gas public companies in Texas for 25 years, both decided to change their future when they applied to the only full-time Estate Planning LL.M. program available. Following acceptance, they said good-bye to their families for nine months to travel to University of Miami School of Law where they would live as students. "Coming back to school after several decades of professional and work experience could be a humbling and intimidating process," said McQueen. "However, at the LL.M. Estate Planning program, we had an intimate group of supportive and bright classmates and the best instructors in the country. Additionally, the program coordinator, Laura Adams, took a very personal interest in each student and assisted with many details like a concierge at a fine hotel. All of these aspects made it a wonderful experience." Over the two semesters the men would meet and become good friends, discussing the various career options they would have upon graduation with a high level of estate planning technical expertise and niche LL.M. in estate planning. 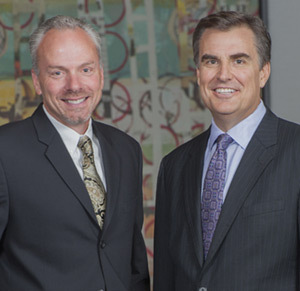 After graduating they decided to work together and prepared a business plan forming a personal and business legacy law partnership, the firm of McQueen & Siddall, LLP. Leaving Miami, the two alums headed back to their homes and families and now run their boutique firm with offices in St. Petersburg, Florida and Scottsdale, Arizona. The website of their firm conveys the type of men Siddall and McQueen are – ones who are open to new ideas as reflected by pursuing an LL.M. degree mid-career and embarking on a new career path. As the firm homepage says, "our entrepreneurial spirit drives us to exceed expectations...fascinated by innovation we strive to redefine the way we practice law every day."